The nights are getting shorter and the days are getting darker. It's important that your winter driving performance remains as strong as it has been throughout the rest of the year. 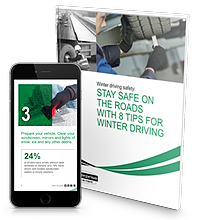 Our guide helps motorists stay safe on the roads this winter. Discover helpful tips on steering clear of trouble this winter, and learn just how important it is to stay alert behind the wheel. Fill in the form to receive your free guide. Your privacy is important to us. We will not share your information with any other company.